Bennett Wilson Poole is the collaboration made for destiny and one set to make a significant mark in the recording annals. Jangle rocking revivalists gets the clichés out the way early, but the two thoughts never stray far from your mind as this self-titled album washes over you. Rampant guitars, wispy harmonies and luxurious tunes combine to place the record in the set position pending the proverbial smash. Wholesomely British and vividly retrospective, the forty-eight minutes parade in a flash with little effect of strain, but plenty of endless uncomplicated ease. The destiny element arrives out of the work Tony Poole, Danny Wilson and Robin Bennett have previously done together, albeit not in this explicit trio format. Tony Poole spans the generations having been the acclaimed leader of seventies English rock band Starry Eyed and Laughing, undeniably influenced by The Byrds. Latterly, he has become producer-extraordinaire; working on albums by Danny’s band, the Champions of World and the Bennett brothers led Dreaming Spires. Being well versed in the Champs and the Spires, and delving back to sample Starry Eyed, it appears that Danny travelled the furthest to settle on the sound of Bennett Wilson Poole, but such is his enthusiasm for development and innovation, this is of little surprise. The eleven tracks brim with cutting tunes, lyrics and sentiment to match, and an optimum pace to keep the listener on board throughout the duration. Two out of the three promotional tracks open the album and act as the perfect hooks. ‘Soon enough’ was first out the block and unveils as a bright and breezy tune containing some stellar guitar breaks. Indeed, our stringed companion is in fine form with the Rickenbacker forever reminding us of this album’s strong influences. ‘Ask Me Anything’ has been the final song to surface in the run-up to the release and contains a great chorus amidst a rising tempo. The thesaurus has been in overdrive to get incredulous and unscrupulous in the chorus, but you cannot beat some lexicon stretching. There are great guitar solos in this track as well. The third track to get a digital pre-release airing via a video sits proudly in the album’s mid-rift and is the curiously titled ‘Wilson General Store’. A blast of harmonica opens this mystery piece before Robin launches the vocals. The whole feel of this track evokes memories of The Kinks and be best described as kitchen sink psychedelia. Vocal exchange is a strong feature of the record, whether swapping lead, mixing within songs or delivering the synonymous harmonies. Even when the album heads into placid waters for three tracks in the second half, the vocal difference and perpetual jangle keeps you hooked in. The tracks in question run consecutively: ‘The Other Side of the Sky’, ‘That Thing That You Called Love’ and ‘Not Forgetting’. While all three protagonists are lead vocalists in their own right, Danny’s soulful tone has the more distinct effect. Just when the album needs a slight alteration, the final two tracks deliver. An acoustic harmony piece complete with a solitary outing for pedal steel titled ‘Find Your Own Truth’ provides a subtle tempo diversion. In true Danny and the Champions of the World style, the album closer is a momentous eight-minute effort full of swirling guitars and lengthy fade out. ‘Lifeboat (Take a Picture of Yourself) is the said track and a juxtaposition piece contrasting the exponential world of the selfie with the equally growing but more disturbing refugee crisis. Politics also figures earlier in the record with the fiery number ‘Hate Won’t Win’. Taken from the famous quote by murdered MP Jo Cox, this song was penned in the aftermath of her assassination. In an act of defiance, the strong message is adorned by a joyous celebratory backbeat suggesting that we will remain undeterred against hideous crimes committed towards the good in society. Just two tracks left to decipher with the soulful pop inspiration to ‘Hide Behind a Smile’ making it one of the candidates to be the first among equals. The line ‘not the race we’re running in’ jumps out as poignant ponderings, while there is a very brief note combination at the end which prompts images of The Beatles’ ‘In My Life’. Each to their own, I suppose. ‘Funny Guys’ concludes the content with more jangle and the vocals of Danny Wilson opening up. What more could you want? 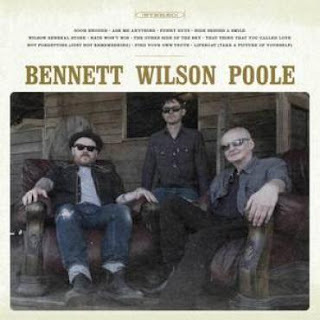 Bennett Wilson Poole is an album perfectly suited for a time to reflect and it will take a seriously good British made record to deny it honours when the time comes to dish out the niche awards. Perfectly gift-wrapped for those of a certain mind-set, any elements of indulgence will be heartily gorged by many folks lauding this album. The fun behind this project radiates out and perhaps most importantly, it is going to resonate widely as we sample a slice of 1968 in 2018.